Geographic & Historic Maps on Yingxian, Datong City Prefecture, Great Wall of China, nearby Gobi Desert Satellite Image including the position of Datong and Buddhist Holy Mountain Area of Wu Tai Shan, North Shanxi Province. 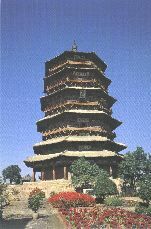 Mu Ta Pagoda, one of the last remaining wooden Pagodas. Only 65 Km from Datong. 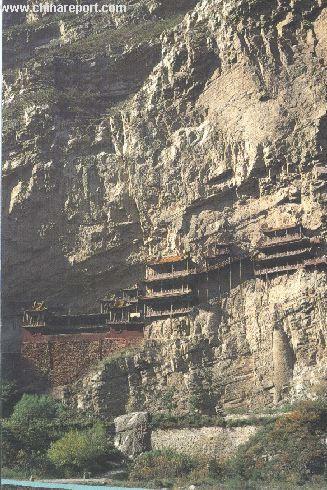 The Cliff-hanging Monastery of HunYuan Village near Datong. 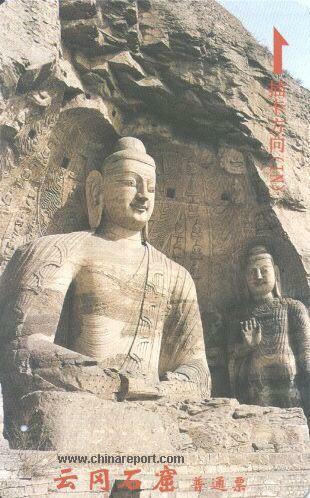 Please browse around the City of Datong and wider Area using our Geographic & Historic Maps. Find out more about the City and Area through our many Photographic Reports on the main historic landmarks and Monuments and their rich history. Not included (yet!) are the Locomotive Museum of Datong, the Buddhist Holy Mountain Area of Wu Tai Shan, The Great Wall of China near Datong and YanMenGuan Pass and the wider area of North Shanxi Province. A Full listing of Yinxian Village Landmarks, Monuments, Hotspots and other sites of importance in alphabetical order. Search through the list to find your Full Report and Photo-Virtual Tour of each monument or landmark within the City, or find Yungang 1000 buddha Caves, Hunyuan Hanging Monastery or other Monuments of the Area surrounding Datong. Recently Datong City near Yingxian Village constructed its own Airport, making it easy to save time and effort and reach the remote City by Air. Flights connect to Taiyuan, the provincial Capital of Shanxi Province as well as to Beijing. Find Datong Dongwangzhuang Airport just west of the Old City District at some 10 minutes driving distance. The Main and only Railway Station of Datong City, located inside the Northern "New" City of Datong and some distance away from Datong's Old City and historical monuments. As the arrival point for many, the Main Station is home to a number of essentail Services and the local CITS Office and Service. Trains leave in the direction of Taiyuan to the south, north to Jining and Hohhot, and east to Beijing.